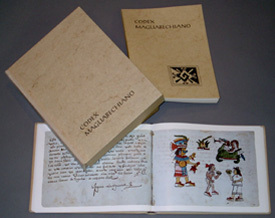 Now, courtesy of Akademische Druck - u. Verlagsanstalt - Graz, Austria, FAMSI provides access to their definitive facsimiles of the ancient accordion fold books created hundreds of years ago by Aztec, Maya and Mixtec scribes. For the last 35 years ADEVA, Graz/Austria has set the world-wide standards in the production of high quality facsimiles. ADEVA has a well diversified program of true-to original reproductions of ancient and medieval manuscripts. In the field of Mesoamerican Studies, ADEVA presently offers about 18 titles, to which further facsimiles will be added.